Scientists think they have found a new species of giant plant-eating dinosaur, Futalognkosaurus dukei , that roamed the Earth some 80m years ago. "This is one of the biggest [dinosaurs] in the world and one of the most complete of these giants that exist," said Jorge Calvo, director of the palaeontology centre at the National University of Comahue, Argentina. He is lead author of a study on the dinosaur published in the peer-reviewed Annals of the Brazilian Academy of Sciences. 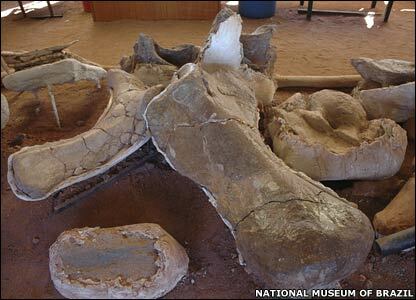 The dinosaur's remains are thought to have washed into a river, creating a barrier that collected the remains of other now-fossilised animals, fish and even leaves found at the site. Since the first bones were found on the banks of Lake Barreales in the Argentine province of Neuquen in 2000, palaeontologists have dug up the dinosaur's neck, back region, hips and the first vertebra of its tail. "It's among the biggest dinosaur finds and the most complete for a giant dinosaur," Alexander Kellner, a researcher with the National Museum in Rio de Janeiro, told Reuters news agency. "The accumulation of fish and leaf fossils, as well as other dinosaurs around the find, is just something fantastic. Leaves and dinosaurs together is a great rarity. It's like a whole lost world for us." Researchers say the fossilised ecosystem points to a warm and humid climate in Patagonia, which had forests during the Late Cretaceous period. The area is steppe-like now and almost bare of vegetation.